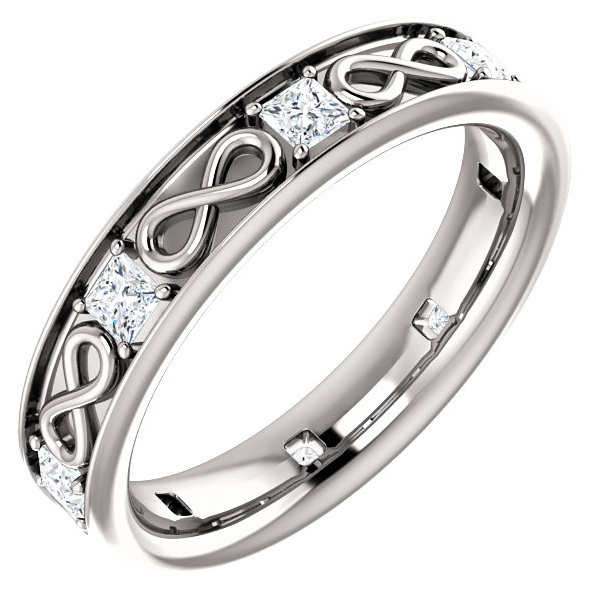 If you are looking for a unique wedding band to make your special day even more spectacular, this 3/4 carat princess-cut diamond infinity symbol wedding band ring from Apples of Gold Jewelry is perfect! The 14K white gold wedding band measures 4.68mm wide, and has a thickness of 2.5mm, making it a sturdy and well crafted ring that will last a lifetime. The ring features a pattern of infinity symbols and princess-cut diamonds. There are 8 sparkling diamonds of 0.10 carats each, for a total of 0.80 carats (over 3/4 carat). The diamond quality for each diamond is G-H for color and SI1 for clarity. The ring weighs 6.73 grams. We guarantee our 3/4 Carat Princess-Cut Diamond Infinity Symbol Wedding Band Ring to be high quality, authentic jewelry, as described above.